If you are a 90s kid that grew up with Sabrina The Teenage Witch this one is for you! Netflix and the creative team of the widely popular Riverdale put a spin on our favorite childhood comic to create a horror makeover of a story that explores coming of age themes. The show debuted on Friday 26th of October 2018 and was accepted with a overwhelming interest by the viewing comunity. It got an average rating of over 7.72/10 on Rotten Tomatoes and a score of 7.8/10 on IMDB. 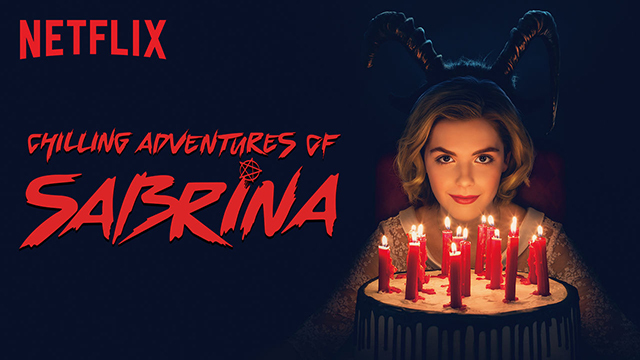 The Chilling Adventures of Sabrina: Part 1 follows the story of a 16 year old girl Sabrina (played by Kiernan Shipka) and her clash with a supernatural world. Although widely overused this scenario is turned over by placing the focus on how Sabrinas’ strong character differentiates from others and how her choices affect the outcome of her life. The story puts on focus her family consisting of two aunties and a cousin which are all part of a witch coven. Emphasis is put on the different beliefs of family members and how they think a child should grow up being disciplined in a specific manner. Her cousin (played Chance Perdomo) is presented as a carefree warlock that is put under house arrest for partaking actions in a crime a long time ago. However he is depicted as a positive thinker and provides support at times when it is most needed. On the other hand her two aunts (played by Lucy Davis & Miranda Otto) are an example of a disfunctional sister relationship which is used as comic relief at moments and as a place for tension in the series. Another topic that the series tackles is the highschool experience of teenagers and how it can have a long lasting effect unto adulthood. Sabrinas’ group of friends consists of bullied individuals whose personal stories add a twist to the supernatural themes of the show. Her relationship with Harvey (played by Disney star Ross Lynch) adds emotional depth and drama to the story with all the unnatural forces that try to divide them. The show sheds light on some controversial religious topics by showing how Sabrina decides not to take the “witch path” and follow her own path. The religious nodes try to focus on how personal choices are important and we should question all the important ideas or notions that are affecting our everyday life. Acompanied by fantastic CGI and visual the creative team makes an amazing experience by throwing in standard archetypes from horror flicks in order to support the original story from the comics. Adding historical events such as witch hunts that happened in Salem encourage a good narrative of how Sabrina has a dual personality both supporting her human and dark character by showing hospitality, kindness and courage. The supporting characters have their own unique stories that in different ways show all the sides of growing up as a kid, as a teen and as an adult. The plotlines all come together in order to suport that idea that a family should stay together no matter the faced hardhips and that everyones’ beliefs should support one another and create a nurturing environement. If you are the kind of person that would enjoy a horror movie with fantastic elements along with the combination of a in-depth storyline the Netflix orignal Chilling Adventures Of Sabrina is your cup of tea.